If you follow my Instagram you might already know that I’ve decided to name my windowsill garlic plant. His name is Greg the Garlic and today he was finally potted in his new home! It has been an incredible self-confidence boost to watch my little garlic sprout and grow and sprout some more! It feels so good to actually have my garden started even if it is just a few baby garlic plants in my kitchen. For the past week or so I’ve kept Greg in a little dish with just enough water to keep the bottom wet. I’ve never “planted” plants in water before so I wasn’t sure how much he’d actually need. Whenever the bottom of the dish got dry I’d add a bit more and that seems to have done the trick because this little garlic has sprung up like a weed! Greg has gotten so big in fact, I felt it was time to get a few of the more mature cloves in some dirt. In my first year of college I took an environmental science course that taught us practical means of living more sustainably and leaving a smaller footprint on our planet. Since that time it’s always been in the back of my mind – the desire for a healthier, less wasteful lifestyle – but between getting married, going to school, having this job then that job, and moving to another state, my desires just never came to fruition. However, now that I have more time on my hands and after everything I’m learning about gardening, it is the perfect time to start! It might not seem like much, only two used K-cups, three old tea bags, and a few egg shells but this tiny soil booster is already reducing waste that would have ended in the trash and then some anonymous landfill. I would have added this to some dirt from out-back but seeing as our yard is covered in about three inches of steadily falling snow… I bought potting mix and juiced it up with extra calcium from the egg shells and nitrogen from the coffee and tea. Next, it’s time to find some pots! I’ve learned so much about apartment gardening and alternative containers that I wanted to put my new knowledge to good use. After scrounging through our recycling I found three perfect candidates. I cut in half two old juice bottles and poked holes in them for drainage. 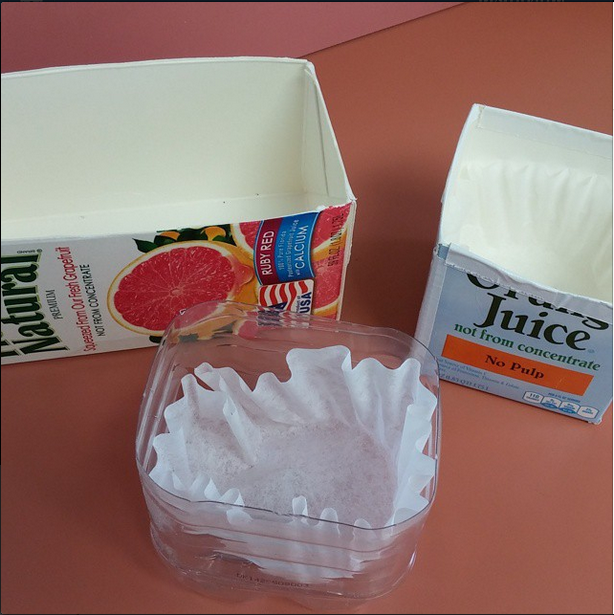 Then I cut one side from a grapefruit juice carton to make a tray to catch the water. I put one coffee filter in the bottom of each of my “pots” to help hold in moisture and soil. Finally, I filled my pots with dirt and chose a few of the taller cloves that had already broken away from the head to plant. Sprinkle with some water and voila! 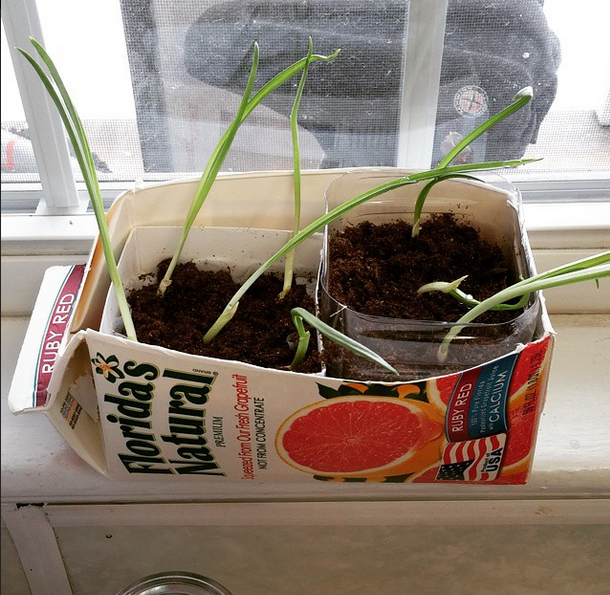 A recycled, windowsill container garden for my garlic babies!